Last Thursday, 13 March 2014, I arose early and, after battling the morning fog that enveloped Salisbury Plain, arrived at the entrance to Stonehenge Visitors Centre after a 37 mile drive from the south coast at 8 35am. My intention was to spend the day exploring the Stonehenge environs, generally and particularly to walk the length of the Cursus and King Barrow Ridge. I was not permitted entry to the main Visitor Centre car park until 9am and was pleasantly surprised that the usual £5 car parking fee for those not visiting the monument itself had been waived for the day. 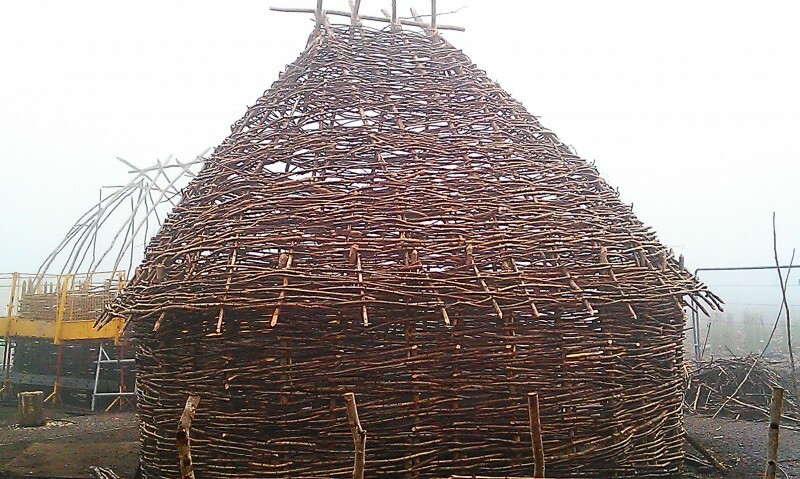 To the east of the new Visitor Centre, a number of Neolithic buildings are under construction, of which the above image is the best of a rather poor set of photographs I captured on the day. This modern-day interpretation of a Neolithic wooden building is being reverse-engineered as authentically as possible to the footprint of post holes and internal hearth positioning of a recent excavation approximately three miles away at Durrington Walls. The 21st century construction platform on a second building underway to the left of the picture does detract a little from the overall impression. Notwithstanding this, prehistoric buildings looming out of the mist on Salisbury Plain last Thursday created a striking and memorable impression in my mind. I am grateful to the volunteers working on the construction of the buildings on the day who patiently provided well-informed answers to the random questions that arose in my mind as I distracted them from their toil. From the post holes, the hearth, and the context of the discovery and current thinking, it has been possible to synthesise the above building. There are, however, post holes that do not lend themselves so readily to such treatment, again within a few miles of the new Visitor Centre. One such example sits south of Woodhenge on the western banks of the River Avon, north of Amesbury. In 2007, the Stonehenge Riverside Project investigated a parchmark feature southeast of Durrington 70 round barrow and re-excavated the Neolithic building beneath (and predating) Durrington 68 round barrow. A brief summary of the excavation is here. The posts are confirmed as ‘nine metres (this is twenty-nine feet, six inches in my language) or higher’. Positioned along the banks of the River Avon, these wooden structures would have stood towards the top of the chalk cliffs. Clearly these man-made sky ‘scrapers’ of their day must have left a striking impression on all who viewed them. An alternative name to skyscraper that does seem appropriate here is ‘Sky Tower’, which for me seems to conjure up potential images with boundless possibilities. I believe this thought-provoking and apt name was conceived by Mr K. West, whose thoughts on these mysterious structures are outlined towards the end of his highly readable recent article here. It appears that a number of these sky towers were left to decay in situ, which immediately brings to mind the Mesolithic posts in the old Visitor Centre car park and begs the simple question, why? I live on the central south coast of England close to the location where the Avon and the Stour rivers merge into one. The combined rivers then enter Christchurch harbour and outflow through ‘The Run’ into the English Channel. On the western side of Christchurch Harbour and to the east of the force of the combined rivers of the Avon and the Stour exiting Britain is Stanpit Marsh with its water’s edge Mesolithic hearths, ancient well and Bronze age barrow. The marsh is a popular destination for birdwatchers. There is a Spring migration of birds from mainland Europe via Cap De La Hague in Cherbourg, France, overflying the marsh, Christchurch Harbour and Hengistbury Head, as they take a main inland route into Britain via the Avon Valley. No doubt our ancestors would have been witness to a similar Spring migration and all variety of migrating birds may have flown past the sky towers on the banks of the Avon before dispersing further north and to the four corners of Britain, Eire and maybe even further afield. In the naturally pristine environment that our ancestors inhabited, this could have been a jaw dropping spectacle of nature for the ‘locals’ of the Stonehenge environs to witness each Spring. That is if there was time enough to raise their heads from the daily toils of Spring and observe the arrival of these creatures of the skies. During the recent Riverside Project, it was calculated that the prehistoric course of the River Avon just north of the location of the sky towers was up to 60 metres wide with a depth of 1.5 metres, compared to 10 metres wide and 0.5 metres deep today (Stonehenge, MP Pearson 2013 edition Page 156). Chapter 10 of this book “Mysteries of the River” is a must read on the subject of these mysterious post holes. In Neolithic times, these wooden structures may have been poised somewhat closer to the riverbank than they stand today. Viewing the above contemporary interpretation of a specific neolithic building one morning in the dense water-sodden fog of early Spring on Salisbury Plain, sitting where the original of probably sat, opened my eyes to practical aspects of my ancestors’ lives in an unexpectedly potent and visceral way. I have a feeling the sky towers will not receive such cultivated attention. These unusual post holes are a fascinating subject to contemplate, to which I hope to return in greater detail in a later post. In the meantime, I am curious to hear of your thoughts, theories, observations and any information at all you may have of these imposing wooden structures that cast such a large and baffling shadow from the faint post holes that remain just below the earth today.